Hello all. 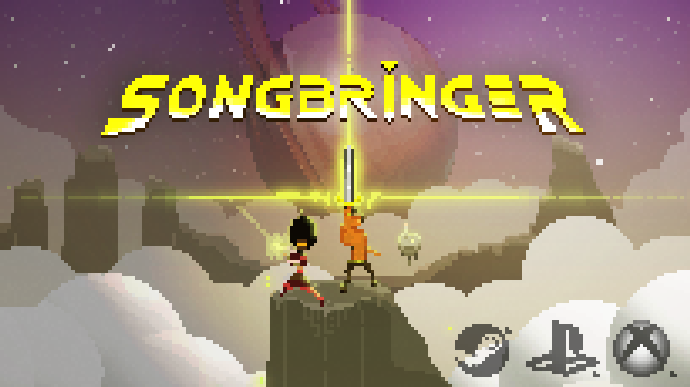 I'd like to introduce you to Songbringer, an action RPG. It procedurally generates an overworld, nine dungeons, the placement of dozens of items and upgrades, NPCs, secret locations, secret paths, secret items, etc. All this based on a six-letter world seed so you can play the same adventure again later or share a world with a friend. It's single-player or local co-op. The two main heroes are a human (Roq) and a skybot (Jib). When Roq finds the nanosword hidden in a cave on Ekzerra, he unwittingly awakens an ancient evil. The sword is pretty fraggin' sweet though. It... hums. Entering the same world seed will always generate the same world. Thus lore and competition can be shared with others. The generated overworld is open and non-linear. Head in any compass direction you like or play dungeons out of order. Three are thematic, containing puzzles and items integral to completing the world. Three are secret, hidden side quests in which abilities can be gained. Three are tough as nails with overwhelmingly difficult foes, mobs and bosses. Songbringer is a work in progress. It is made possible thanks to all the great encouragement, feedback, comments and suggestions from the community. Some of the best ideas have come from you guys watching the daily live stream! Thank you all! Ha! sweet, nice animations and movement. Haha he does! If only Abraham Lincoln, Vampire Hunter were a better movie I could site it as an inspiration. Your comment gets me thinking maybe the hero's last name should be Abraham?? It certainly would draw attention to the fact that his hat bears resemblance and could add a bit of humor. In times of peace the people learn to party. This story is not about one of those times. Songbringer is the name of an interstellar ship full of 400 art-warehouse comrades. As our story begins she sails the solar hyperspace winds, her tack for the sun Bellatrix. This ship herself, along with 9 other spacecutters, sails to Ekzerra, mystical, mysterious and mostly unexplored planet where law enforcement rarely make appearance. It’s the yearly gathering know as Breakbeat. It’s the year 13,003 BC as we would count, and just about nobody is sober. When partygoer Roq Jillebrun eats a cactus and decides it would be a fine idea to explore the planet’s surface, he unknowingly triggers a war. And not just any war neither. The Second Great War of Wizards, involving not only all of Songbringer and Ekzerra but much of the Milky Way Galaxy. Beep bop boopboop this is my signature. Sweet! Can't wait to get it out so you can play it. folks out there might think I'm crazy, but I've got to rescue Daisy! Did you know light sabers are actually copyrighted intellectual property? Yeah. Anyway now that Disney owns Star Wars maybe they'd be a little more lenient about it. I was thinking the ultimate sword in this game is some sort of nano-tech enhanced thing. Also maybe swords have notches that can be filled with nano-tech / elemental powers. Like a fire orb that turns your sword into flames... Definitely open to suggestions though! No one has a wider rock stance than Slash. We can all learn a lot from him. Did you know light sabers are actually copyrighted intellectual property? Yeah. I'm not surprised, on the other hand it's been used so often in popular culture (including games) that I doubt there's any problem unless you call your hero luke skywalker or something, a 'shining sword making a buzzing sound when swung', can that be the 'intellectual property' of someone ? Madness. You know what? You got me thinking a little more devil-may-care. I'm at least going to add some rad buzzing noises!